Best known as TOSRV, the bicycle Tour of the Scioto River Valley is one of America's bicycle enthusiasts best known classic bike tours. Started in 1962, the 200+ mile tour makes the annual pilgrimage from Columbus to Portsmouth and back each May on Mother's Day weekend, rain, shine, sleet, snow or wind and sometimes all of the above on the same weekend. 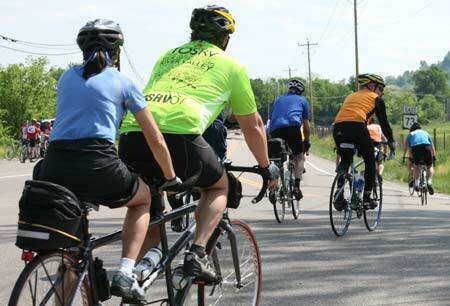 Although the tour is mostly conducted on rather even terrain, it is not a bicycle tour for part-time weekend riders. Even if you decide to do only half of the journey just to Portsmouth, it is not easy to put 100+ miles on un-trained legs. When you reach the 50+ mile marker going down, the bikers do run into some rather steep climbs, but the route thankfully misses some of the really nasty hills associated with southern Ohio. 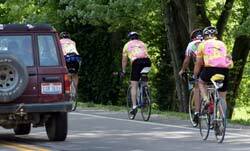 TOSRV is a road tour, which means riders get to share the open road with vehicles and while most motorists are sympathetic to the 2 wheelers, others seem to have a short delay-tolerance. Most of the trip is on 2-lane roads and in some places the roads are hilly with lots of no passing areas. This means motorists get stuck where they can't comfortably pass-- this leads to short-delay tolerance and sometimes stupid decision making. In other words, be careful. Fatalities have occurred on the trip. They are rare. One cyclist was killed in 2008 by a hit and run motorist (the motorist later came back a half hour later) and cyclist wasn't on the approved route. Keep on your toes, keep aware of your surroundings at all times and follow the rules. Don't assume that everyone knows why you're there and will treat you with respect. Be especially alert when the weather is bad. Be especially alert when the weather is good. The tour starts at the Ohio Statehouse in Columbus and heads south. It used to follow SR 104 on the west side of the Scioto River, but in recent years because of increased traffic along the route, they switched the route so it travels on the east side of the river on a less traveled road into Circleville. At Circleville, the route crosses the river and then follows the original tour route the rest of the way to Tracy Park in Portsmouth. 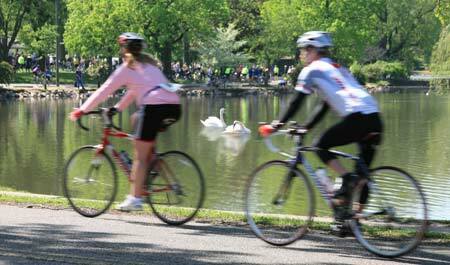 Each year the event regularly hosts anywhere from 2,000 - 4,000 riders of all shapes, sizes and ages. 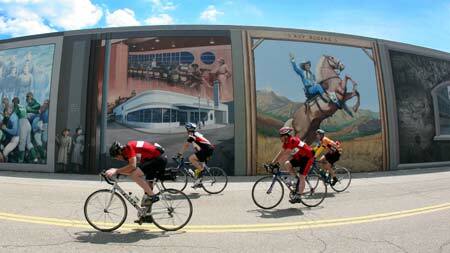 With so many riders, the organizers (Columbus Outdoor Pursuits) have developed a staggered departure schedule. This helps spread out the pack and helps cut down on congestion and reduces the risk of collisions between riders. When the riders reach Portsmouth, after having ridden 100 miles, they get to sleep on the floor in their own sleeping bag. Hotels / Motels in the area are usually booked well in advance. The good news for the riders is that their sleeping/bathing supplies will be carted for them from Columbus to Portsmouth, so they don't have to worry about carrying all that extra weight (40 pounds maximum). Riders have to make sure they are equipped with appropriate weather gear. May is a notorious month for wild weather swings. It can be warm and calm on Saturday morning and by mid afternoon, it can be cold and raining. Take some spare socks along and put them in a zip lock bag to keep dry in the event of bad weather-- you'll really appreciate those later in the day. There are numerous rest stops along the way with first aid stations provided by the American Red Cross. Individual chase vehicles, commonly called sag wagons, are not permitted on the course, but those wishing to have an emergency vehicle follow them can use the alternate route of SR 23 with access to the course at the food stops (approximately every 25 miles). The traditional TOSRV starting and finishing point is the Ohio Statehouse grounds in downtown Columbus. Tour Registration will be held just south of the Statehouse at the Hyatt on Capitol Square at 75 E. State Street. TOSRV is not for the casual cyclist. To enjoy TOSRV you should have ridden at least 400 miles during the 2 months prior to the Tour including at least one 75-mile day. In addition, you, your bicycle, and equipment must be in top shape. TOSRV requires all entrants to wear an ANSI, SNELL, or ASTM/SEA-approved helmet. The TOSRV Registration at the Hyatt on Capitol Square will be the focus of activities before the Tour. Registration will be open from 4:30 – 9:30 p.m. (and 5:00 – 8:30 a.m. Saturday). In addition to Registration, the Hyatt will host a variety of vendors offering an assortment of bicycle equipment and clothing. The Hyatt also is offering a “Bottomless Bowl of Pasta” buffet with bread and butter for $17.95 at the Plaza Restaurant from 5:00 – 9:30 p.m.
TOSRV riders can also take advantage of discounted Friday night room rates at the Hyatt. TOSRV rider rates (excluding tax) are: $121 single or double, $131 triple, and $141 quad (plus applicable tax— check hotel for current pricing). Reservations should be made before April 20, to receive the TOSRV special group rate. The special rate is available from Thursday through Monday on the Tour Weekend, based on room availability. For those with a watchful eye on expenses, sleeping bag space is available at the YMCA at 40 West Long St. for $15.00. You just need to show up at their door between 8:00 and 11:00 p.m. You may bring your bike into the YMCA with you. Things get a bit hectic, especially at the hotel elevators, so riders should plan their activities carefully. If you're an early riser, remember, not all the shops in the area will be open early. Rest stops along the way usually have something like bagels, pastry, breakfast bars, hot chocolate, and coffee. But remember, that first rest stop isn't for about 25 miles. 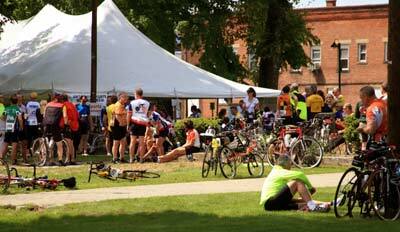 At the halfway point in Chillicothe there will be a much larger tent and rest facilities. When the riders get to Portsmouth, they'll probably be greeted by a band playing and a massage tent where for about $20, you can get a good rub-down. And, you can usually load up on carbs at the spaghetti dinner that night. You'll find a few things will be helpful if you do a little advance planning. Put miles on your bicycle... lots of miles, before the Tour. Training should begin in late February or early March. Don't start out trying to do 25 miles a day, but work up to it. Then put in some 50 miles on Saturdays and again on Sunday. Prepare your gatorade and bagel breakfast the night before. Take extra pairs of socks and keep them in a zip lock bag to keep dry. Take some Alleve or other ibuprofen pain relievers and send them ahead with your baggage so you can get a little rest during the night Saturday. Be extremely careful during the first 10 miles. This is where many accidents happen. Beware of other riders and their inexperience. Emotions and adrenaline are soaring at this point and mistakes and miscues are inevitable with large groups of riders. Remember: it's all downhill from Columbus to Portsmouth, and it's all uphill from Portsmouth to Columbus. Pack cold weather clothing and keep it with you. Temperature swings can be extremely severe. One year on Sunday the temperature started out at 60 but dropped to nearly freezing by mid afternoon. Remember: TOSRV is a tour and not a race. There are some fanatics that like to race the route, but this is a trip you should savor.